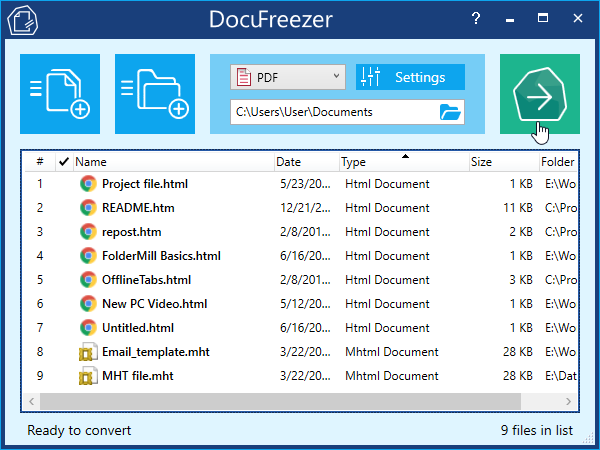 DocuFreezer / How To / How to Convert HTML to PDF? The webpage we see on the computer monitor is a file saved in the HTML format. But the HTML is not as universal as other existing file formats, which means that in case you need to demonstrate an HTML file on another device, chances are that it will look distorted, or will not be displayed at all. The necessity to convert HTML to other formats is pretty frequent, and the choice of the output format depends on the purpose of its further usage. One of the popular file formats where HTML can be converted is PDF. PDF is the format for storing documents when it’s important to preserve their contents untouched. The webpage converted to PDF will create an electronic document that can be displayed everywhere demonstrating the contents of a webpage exactly the same as they look originally. PDF is able to save the original look of a document for years ahead; plus, no matter which device the document is opened by, it will be represented without any alterations. Select the files you wish to convert and add them to the list. Select the destination folder and the output file format (PDF in our case) and click Start. The resulting PDF files will appear in the destination folder you’ve selected and will satisfy all the PDF criteria and specifications. It will be opened by any PDF viewer. Convert JPG to PDF with DocuFreezer 1.2!